When I was a girl, I remember reading a book by Richard Kennedy, called Amy's Eyes. In the story, an orphan girl (Amy) brings her beloved sailor doll to life by pricking it with a pin. The sailor doll slowly grows into a real man and when he can no longer be hidden within the orphanage, the sailor sets off to find his fortune at sea. In her sadness at losing her beloved companion, Amy turns into a doll herself... with the most beautiful button eyes. As I complete my amigurumi projects, I am often reminded of that story -- and how the button eyes were the only sign of life in "doll Amy." And believe it or not, that story is one of the reasons that I put so much care into selecting eyes for my projects. For someone, the doll I make may be a companion -- and the right eyes give my dolls life. 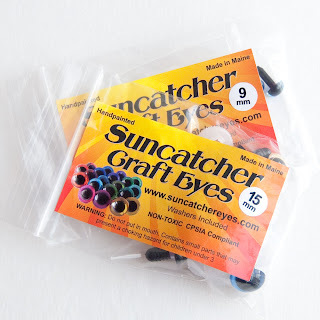 Now, most of you know I have a favorite eye vendor already and you may be a little surprised that I was willing to do a review for Suncatcher Eyes. But here's the deal... a smart business-person always has a back-up for critical pieces in the supply chain. So, for if my favorite supplier is out of stock or just can't get the look I need, Suncatcher Eyes is my ace in the hole. And this ace? Well, let's just say they aced the review! So, let's talk product, shall we? Suncatcher Eyes are hand painted in the USA (Maine, to be precise), non-toxic, and CPSIA compliant (huge bonus for those of us who sell finished dolls in the US!). 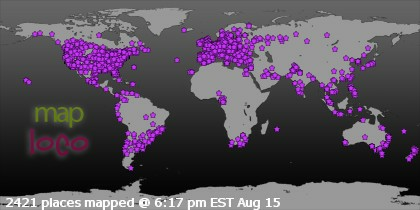 International shipping is available and rates are carefully outlined on the shop site -- so for my international followers, there are no surprises. The painting is done carefully and the attention to detail is evident even in the packaging. 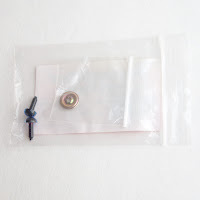 For example, my 9 mm eyes (with metal washers) were packaged separately from the washers so that the eye paint would not be scratched (if that's not pride in workmanship, I'm not sure what is). I was particularly interested in transparent eyes since my favorite supplier does not usually carry them -- and Suncatcher did not disappoint. The colors were rich and obviously done in multiple coats to get such a beautiful shade. The eyes fit into my gumdrop mouse pattern beautifully (I choose transparent eyes on this design because I like the candy-like sparkle they give the piece). 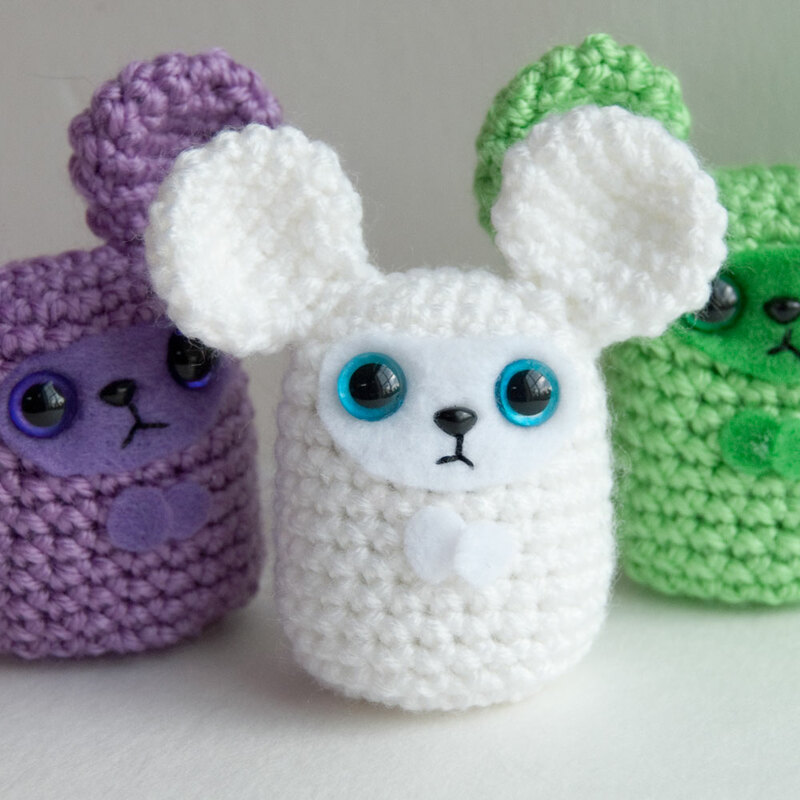 I'm especially fond of the little white mouse and his crystal blue eyes -- which one is your favorite? 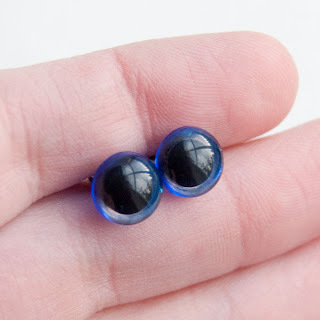 Ironically, Suncatcher Eyes does not carry the 6 mm noses used in the finished pieces (those were purchased from 6060 eyes) -- but that just proves my point that you should never limit your choices! 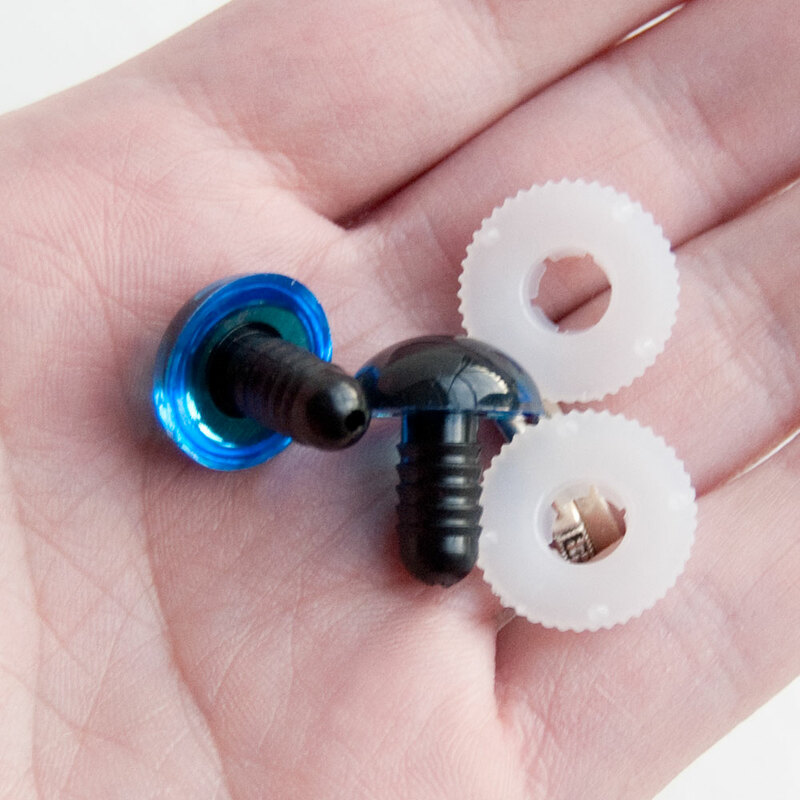 I also received sample sets of 15 mm eyes with plastic washers. Like the smaller eyes, you can easily see that each piece is carefully painted with attention to detail. I mean seriously, look at how that blue just pops! I'm reserving this pair of eyes for a special project... perhaps a zany amigurumi Floyd doll... who knows? And based on these samples? Well, I'll definitely be back to the Suncatcher Eyes shop when I need my next order of transparent eyes!